In the 1930s and 1940s, Americans loved opera. There were regular opera broadcasts on the radio, and it wasn’t a foreign and unsupported art form. Today, most opera companies are having financial troubles, but Broadway musicals — they’re big business. Enter the Gershwin organization. They have what might be the classic American folk opera — George and Ira Gershwin‘s Porgy and Bess (with a book by DuBose and Dorothy Heyward). But revivals by opera companies are rare (the last big successful one was the 1976 Houston Grand Opera revivial, which I had the fortune of seeing). The question was how to reintroduce this masterpiece to modern American artists, who are schooled on the Broadway musical form, not operatic forms. Their answer: they brought in Diane Paulus, who had successfully revitalized and reimagined “Hair” (and would go on to do the same for “Pippin“). She, in turn, brought in Suzan-Lori Parks to adapt the book, and Diedre L. Murray to adapt the score, and in 2011, the updated “The Gershwin’s Porgy and Bess” opened. This trimmed the show a little, and reworked the score to punch it up to (what I would characterize) as a brighter organization and interpretation. The director also played with the direction, moving the action from the more operatic to the realism of Broadway. The reaction to these adjustments were decidedly mixed: Some Broadway notables and purists (such as Stephen Sondheim) raked this over the coals for the changes; others appreciated how this made it more acceptable for the masses. When the Ahmanson Theatre announced they were bringing the show in for the 2013-2014 season, my desire to attend was decidedly mixed. After all, I had seen the 1976 Houston Grand Opera production (which was relatively definitive). But then I heard on a Broadway sampler the updated version of “I’ve Got Plenty of Nothin'” and was very impressed; additionally, I learned my wife had never seen the show. Thus Hottix were in order, and we squeezed it into the schedule for May. Last night saw us at the Ahmanson; here are my thoughts on the update. First and foremost, I’m hoping everyone is familiar with the story of Porgy and Bess. It basically is the story of the inhabitants of Catfish Row near Charleston SC in the 1930s. The main characters are Porgy, a disabled beggar; Crown, a powerful man with a powerful temper; Bess, a perceived loose-woman who is Crown’s girl; and Sportin’ Life, the community drug dealer. The rest of the characters are the inhabitants of Catfish Row; notable inhabitants are Jake and Clara and their newborn baby; Serena and Robbins; and Mariah, an elder woman in the community. When Crown kills Robbins after a gambling fight, he runs away and hides. This leaves Bess to take up with Porgy, who falls in love with her. Over time, Bess is accepted by the community. After the church picnic on Kittiwah Island, Crown reappears and tries to draw Bess back into his sphere of control. She resists, and he (in modern terms) assaults her. She eventually returns to Catfish Row, and Porgy vows that he will defend her. Life returns to normal, but when Jake is lost in a hurricane, Clara goes out after him, and Crown (who has returned) goes out after the two of them. Only Crown returns, and fights Porgy for Bess. Porgy kills Crown during the fight. The police come and take Porgy away; while Porgy is away, Sportin’ Life convinces Bess he will never return. She goes off to New York with Sportin’ Life. When the police return Porgy, he is eager for Bess; when he discovers Bess is gone, he starts on his way to New York to find her. Having see the early traditional production, I could sense some of the changes that were made. The primary one was in Porgy. Traditionally, he was portrayed as having no use of his legs, and got around on a cart. This production gave him a club-foot and a brace. This made Porgy stronger and more attractive, and perhaps hurt the narrative. To me, it was a small hurt and didn’t affect the story. Other songs were clearly brightened in subject and tone; this is certainly apparent in “I’ve Got Plenty of Nuthin'”, where “Nuthin'” was changed from the prima facie meaning of possessions to a more sexual tone. I also noticed some changing of language in some songs, particularly in “It Ain’t Necessarily So”. But these are things that a purist would note. For the audience member unfamiliar with the story (as are most folks these days), this is a grand introduction to the story and the music. Those who fall in love with the piece can then discover the traditional operatic form. I’ll note that there were similar objections to the 1959 movie, which drastically cut music and changed orchestrations (as well as dubbing voices). Still, that movie served as an entry point for audiences to the piece, drawing them in to later stage productions through their familiarity. In short, overall, I think this is fine introduction, and would serve very well to familiarize a modern audience with this classic piece. The performances in this touring company were spectacular. Alas, we weren’t blessed with the original Broadway leads (gone are the days when Broadway folk would play the LA Civic Light Opera productions). If what we got was the second tier, then the first tier was “blow the roof off”, for the leads we had were great. As Porgy, Nathaniel Stampley had a stunning voice and captured the club-foot well. He also gave off a charisma that was palpable — you could see why he was treasured by the community and was attractive to Bess — despite his disability. Alicia Hall Moran‘s Bess was also great, with a lovely voice and wonderful performance. With Bess, I particularly noted her behavior during Robbins’ funeral. She was separate from the community and clearly going through drug withdrawal. You could see, with Moran’s portrayal of Bess, how the love and compassion of Porgy and the community changed her and facilitated her recovery. It also showed how fragile her recovery was; given a major bump in the road she easily fell back into the habit. Here the community was perhaps too judgmental in response (perhaps demonstrating the effect of the lack of Porgy’s presence): Moran clearly portrayed how that judgement (evidenced by Mariah drawing away Clara’s infant) affected Bess’ future. You could clearly see that her performance convinced the audience of the reality of her character. Great performances from both Stampley and Moran. The other main characters were Crown and Sporting Life. Crown, as portrayed by Alvin Crawford, had both the physical presence and voice to covey the powerful and strong nature of the character. What he couldn’t bring across at the 100% level was the menace and unpredictability (his smile and friendliness during the curtain calls made clear that joy was an aspect of his personality he couldn’t completely submerge). Kingsley Leggs‘ Sporting Life was suitably dapper and was a strong singer. I enjoyed his “Ain’t Necessarily So”, but he didn’t quite come off as the enticing snake in the grass at the heart of his character. But these were minor off notes; the overall essence of these characters shone and the voices were wonderful. The other inhabitants of Catfish Row both the named characters in the program as well as the unnamed ensemble members sang strongly, and (more importantly) seemed to become their characters. This was visible in their small actions in the background during songs. They were purposeful in their portray, not just supporting dancers. It is hard to find ways to single them out that don’t sound repetitive. Still, I must note how well Sumayya Ali as Clara and David Hughey as Jake worked well together during the opening number — you could easily believe that they were a loving and playful couple. Danielle Lee Greaves‘ Mariah and Denisha Ballew‘s Serena also had their moments — Greaves was just spectacular and humorous in “I Hates Your Strutting Style” and Ballew gave moving performances in “My Man’s Gone Now” and the “Dr. Jesus” numbers. The remaining named and ensemble inhabitants of Catfish Road were James Earl Jones II (Robbins), Kent Overshown (Mingo, the undertaker), Sarita Rachelle Lilly (Strawberry Woman), Chauncey Packer (Peter, the Honey Man), Dwelvan David (The Crab Man), Roosevelt Andre Credit (Fisherman), Nkrumah Gatling (Fisherman), Tamar Greene (Fisherman), Adrianna M. Cleveland (Woman), Cicily Daniels (Woman), Nicole Adell Johnson (Woman), and Soara-Jye Ross (Woman). The two white, non-singing roles were Dan Barnhill as the Detective, and Fred Rose as the Policeman. Vanjah Boikai, Quentin Oliver Lee, Cheryse McLeod Lewis, and Lindsay Roberts were the swings. Note that if you compare this to the Wikipedia cast, you’ll see a number of characters lost their names and distinction to become anonymous, and a few were elided out of the story completely. This may have been due to cost; it may also have been a side effect of moving away from the operatic form that has many small roles. I don’t think the loss is noticeable, but purists will likely object. Turning to the movement and the music. The choreography was by Ronald K. Brown. There are a few dance numbers in the show (such as the opening dance number at the top of Act II), but most of the movement was integral and fluid. All of the movement was well executed and delightful to watch; none of it seemed to be dancing-for-dancing sake. Music supervision was by Constantine Kitsopoulos, and John Miller was the Music Coordinator. Dale Rieling was the musical director, and conducted the large 24-piece orchestra. One rarely sees orchestras that large in modern musicals — usually you’re lucky to get 5-pieces, given the economics of musicians these days. The size of the orchestra gave a wonderfully lush quality to the music — this was a show where you could listen and enjoy, and not be blown away by over-amplified instruments assaulting your eardrums. I’m sure the folks at Center Theatre Group are saving that for the next musical with includes the Queen portfolio. Orchestrations were by WIlliam David Brohn and Christopher Jahnke. Lastly, let’s look at the technical artists. The scenic design was by Riccardo Hernandez, and was barely there. There was a backdrop. There were a few props. That was it. Now I remember the Houston Grand Opera’s production — Porgy’s cubbyhole on the side, a well-worn house for Serena that housed the community during the hurricane, a center plaza with hovels all around. None of this was onstage at the Ahmanson and … I didn’t miss it at all. The actors were so convincing in their characters that my mind created the necessary scenery. That, my friends, is acting at its best. The lighting more than made up for the lack of scenery as well. Loads of yellows and warm colors, and flashes during the hurricanes. But what I noticed more was the shadows. From where we were sitting, in a number of scenes, the shadows became an additional character, amplifying the portrayals and the mood. Kudos to Christopher Akerlind for the excellent lighting job. The sound by Acme Sound Partners mostly blended in and wasn’t over powering, but there were a few static bursts (probably due to audience members who did not turn off their cell phones, grrrr). The costumes by ESosa fit the characters well and had no problems that stood out; they worked well to portray both the poverty of the community and the esteem with which the held their church clothes. Wigs, hair, and makeup were by J. Jared Janas and Rob Greene and seemed appropriately period; in particular, I didn’t observe any obvious modern black hairstyles or straightening. As noted earlier, Diane Paulus was the director; Nancy Harrington was the associate director. John M. Atherlay was the Production Stage Manager, and technical supervision was by Hudson Theatrical Associates. 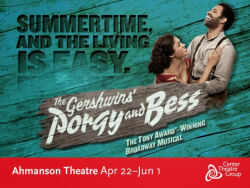 “The Gershwin’s Porgy and Bess” continues at the Ahmanson Theatre through June 1. Tickets are available through the Ahmanson online box office. Hottix may be available; call Ahmanson customer service and ask. Tickets may also be available on Goldstar and LA Stage Tix. The production is worth seeing, unless you’re a Porgy and Bess purist. Upcoming Theatre and Concerts: This evening brings “Cat on a Hot Tin Roof” at REP East (FB). The next weekend brings the musical “Lil Abner” at LA City College (directed by Bruce Kimmel, with choreography by Kay Cole). The last weekend of May is an offbeat parody musical: “Zombies from the Beyond” at the Lex Theatre. June is also busy. It starts with a CDF Conference for Karen while I see “The Fantastiks” at Good People Theatre (FB). We lose the following weekend to a Bat Mitzvah. The remainder of the month brings “Stoneface: The Rise and Fall of Buster Keaton” at the Pasadena Playhouse (FB) on June 22, and “I’m Not Just a Comic Genius” at Secret Rose (FB) on June 27. July will be busy: “Ghost” at the Pantages (FB) on 7/5, “Return to the Forbidden Planet” at REP East (FB) the weekend of 7/12, “Once” at the Pantages (FB) on 7/19, “Bye Bye Birdie” at Cabrillo Music Theatre (FB) on 7/26, and “Family Planning” at The Colony Theatre (FB) on 8/2. August then remains quiet as we work around vacations and such, but things start to get busy again in September and October. More on that later. As always, I’m keeping my eyes open for interesting productions mentioned on sites such as Bitter-Lemons, and Musicals in LA, as well as productions I see on Goldstar, LA Stage Tix, Plays411.